Sharp essentially dominated the market in the early days of LCD TVs. Lately, though, it's found some serious competition both from up-and-coming brands such as Syntax and Westinghouse, which have created a vicious price war, and from other established brands such as Sony, which have pushed hard with ever-more-elaborate marketing campaigns. Sharp still has more LCD models than anybody else, however, and the models we've reviewed have consistently outperformed most other flat-panel LCDs. While Sharp's 32-inch LC-32D4U does have some image-quality issues, it's still among the better-performing LCDs on the market. For people want a better picture, as well as a good selection of cutting-edge features, the Sharp LC-32D4U is among the best choices on the market -- as long as you don't need to connect a PC. 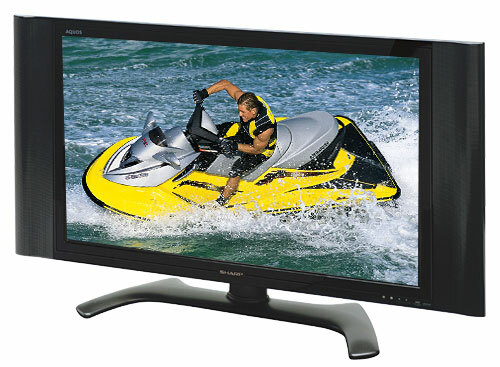 With a native resolution of 1,366x768, the same as most LCD TVs in this size range, the Sharp LC-32D4U has more than enough pixels to display full 720p HDTV. All incoming signals, including HDTV, standard TV, and DVD, are scaled to fit the available pixels. A built-in ATSC tuner serves up over-the-air digital and HDTV, while the QAM tuner and the CableCard slot can serve up digital and HD cable without the need for an external box--especially useful if you want to install the TV on its own, away from an entertainment center. Since the Sharp lacks a TV Guide or other EPG, you'll lose the programming info that comes along with a cable or satellite box. Of course if that's important to you, you can always add an external box from your favorite provider. Convenience features are few. When was the last time you've seen an HDTV without picture-in-picture? One cool extra is Freeze, which captures the onscreen image and holds it until you press the Freeze button a second time--great for writing down the phone number to buy that oh-so-unique pearl necklace on QVC. Unfortunately, this feature is not available when using the HDMI input. The four aspect-ratio options available for standard-def sources include Side Bar, which properly displays 4:3 material, and Smart Stretch, which stretches sides more than the center so that 4:3 sources fill the screen. Impressively, four modes are also available for HD sources, including Zoom and Dot by Dot, which matches the incoming source pixel by pixel. Other features include horizontal and vertical positioning, picture flip, and input labeling. The Sharp LC-32D4U's connectivity left us wanting more. There's one HDMI input, and although most other LCDs are also equipped with just one, some, such as Dell's W3201C, have a second. Most 32-inch LCDs do have a PC input, however, while the LC-32D4U does not. That's a major omission in our book. We were pleased to see two component-video inputs; the slots can also accept composite video. A third composite/S-Video input is on tap, as well as one CableCard slot and three RF inputs for cable and antenna tuners. There's also an RS-232C terminal for integration with a home-theater control system. Outputs include one S-Video, one composite, one stereo RCA pair, and one optical digital audio out.